The first hardy settlers on Kangaroo Island in 1836 had to decide whether to go it alone with a settlement on the island or revert to the mainland. Today, the 4400 or so people who call the island home face a similarly stark choice: energy independence, or continued reliance on the mainland. On one hand, the ageing existing cable could simply be replaced, at a cost of between $22 million and $50 million. This is the “preferred network option” proposed by the local electricity distribution network, SA Power Networks (SAPN). The new cable option is straightforward and well understood, if a little uninspiring. The local renewable power supply option means energy independence, more local investment and economic activity, and a boost for the tourist mecca’s clean, green brand. But it also requires solutions to a series of tricky technical and regulatory issues, at a scale never before attempted in Australia. To help inform this crucial decision by SAPN and the Kangaroo Island community, I and my colleagues at the Institute for Sustainable Futures (ISF) at the University of Technology Sydney yesterday published a study of the feasibility of renewable energy for the island. We conclude that Kangaroo Island could be powered by 86-100 per cent renewable energy for about the same cost as replacing the cable to the mainland. 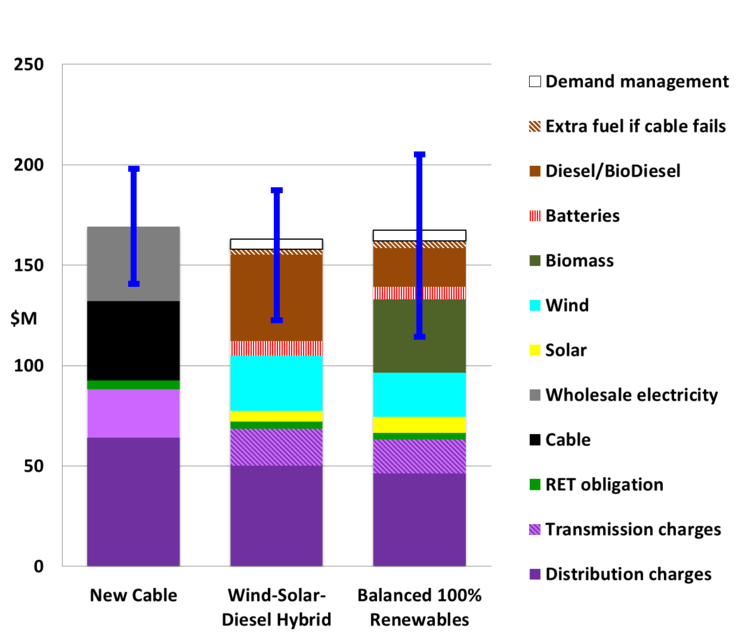 We examined 10 different electricity supply scenarios for Kangaroo Island. The direct costs of the three most interesting scenarios are shown below. 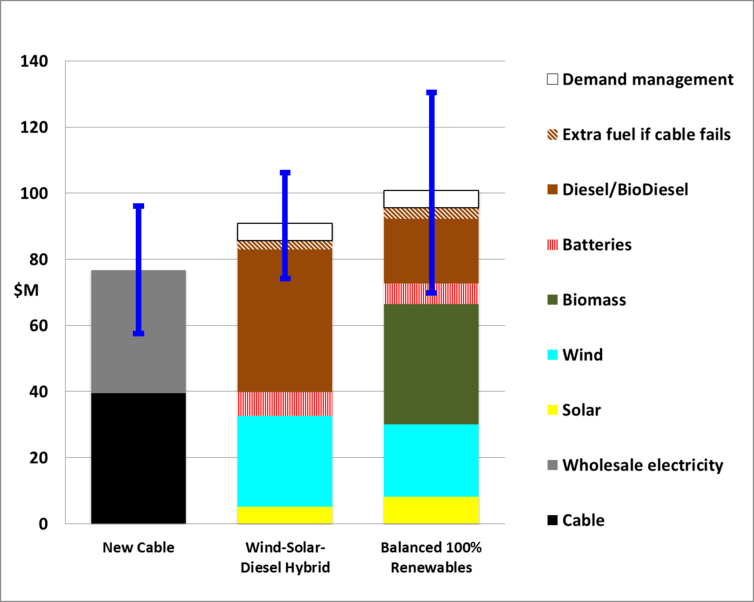 The most cost-effective alternative to a new cable is local supply of wind, solar photovoltaics and diesel generation, complemented by battery storage and “demand management”. This hybrid solution could supply the island with 86 per cent renewable energy for only $10 million more than a new cable option. This option would also meet SAPN’s tight deadline of being able to meet the island’s entire electricity demand by December 2018. For a further $13 million, 100 per cent renewable power could be provided by displacing the diesel with biomass generation technology fuelled by local, currently unharvested plantation wood. We estimate this system could be established within five years. Both the hybrid and 100 per cent renewable options could actually cost Kangaroo Islanders less than the new cable over a 25-year period, if we factor in indirect impacts such as savings in local network charges. So with the cost of the different options roughly comparable, the choice of power supply will probably depend on other factors. These include the preferences of the local community; how the costs, benefits and risks are shared; and the level of support from key stakeholders including SAPN, government and regulators. For local generation to be cost-competitive, SAPN’s funds earmarked for the new cable would need to be redirected to support local generation and demand management. However, the current regulatory system creates barriers to SAPN providing this support. For example, SAPN can earn a net financial return on investment in network assets such as a new undersea cable over their 30 to 40-year life. But if, instead of investing in a new network asset, SAPN spends money on supporting local supply options, then at best it can retain only a few years’ savings by deferring capital investment. Another challenge for local electricity supply is ensuring that local electricity suppliers do not abuse their monopoly by price-gouging customers if and when the existing cable eventually fails. Two possible ways to guard against this are by sharing community ownership of generation assets, and by periodic tendering of retail services. For a local electricity supply solution to proceed it requires strong support, from both the Kangaroo Island community and SAPN. It would also require a major third party, such as the SA Government or the Australian Energy Regulator, to help reduce the barriers to SAPN adopting a more innovative non-network solution. A balanced local electricity supply solution and a transition to 100 per cent renewable power could deliver a range of economic development and other benefits to the local community. But it will require market testing to confirm the costs, and stakeholder and community consultation to develop a suitable regulatory and business model. It is unclear who would provide the time and resources for such leadership, but the SA Government and the Kangaroo Island Council are two possible candidates. Addressing such barriers in the context of Kangaroo Island would provide not just an inspiring local solution, but a powerful precedent for supporting local renewable energy initiatives throughout Australia. Within months of their arrival in 1836, most of the original Kangaroo Island settlers had left to set up the new mainland colony of South Australia. But a few enterprising souls stayed on. We will soon see if that pioneering Kangaroo Island spirit prevails when it comes carving out Australia’s clean energy future. A community forum will be held on September 22 in Kingscote, Kangaroo Island, to share the study’s findings and canvass community views about future power supply options. The full Towards 100% Renewable Energy for Kangaroo Island report can be read here. Chris Dunstan is a research director at the Institute for Sustainable Futures at the University of Technology Sydney. The “Towards 100% Renewable Energy for Kangaroo Island” study was funded by ARENA and RenewablesSA with assistance from the Kangaroo Island Council. This article was first published on The Conversation.